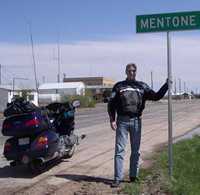 Motorcycles are an excellent way to see Texas - especially the less congested roads of West Texas. But beginning and ending your trip in Kansas is only recommended for seasoned riders. 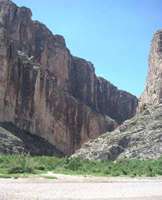 Over the years we have heard from a variety of people who have taken the time to write and tell us about their Texas trips - like the young Polish man who (while training in Dallas) spent five weekends in a row driving to Big Bend. Five weekends in a row (!) We wish we could publish every story we've received, but it's not possible. We are, however, able to feature this trip taken by Richard and Judy Berger since they gave permission to use some of their outstanding photos. 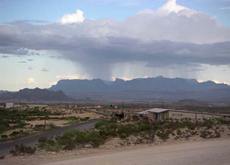 Skill, serendipity and just plain luck (like catching rain over Terlingua) have made this trip one deserving a closer look. After an unannounced arrival in Texas, their trip begins with Archer City and after a brief disappearance, they surface in San Saba before descending into the Hill Country to Luckenbach and Bandera. They then head out to the Badlands of Langtry, Sanderson. Alpine, Terlingua, Castolon, Presidio and up through Marfa and Fort Davis to Pecos. The Bergers took the road less traveled to include Orla, Mentone, and Notrees before getting delayed by rain in Lamesa (a seldom heard phrase therabouts) on their return run to Kansas. The Berger's enthusiasm for Texas is infectious. You've got to like people who take time out to smell the chickens in Bandera or make friends with the courthouse werewolves of Mentone. Richard holds a wind-blown sign in place until the Loving County emergency sign crew could arrive. "We're from Kansas and took a week-long motorcycle trip to West Texas a week ago.It was a fantastic trip and we relied heavily on your entertaining and useful website for the pre-trip planning. I put together a slide show of the ride. Please feel free to use any of the info or pictures on your website that I've posted there." "I'll let you know if we ever do Kansas like that, but to be honest, there's really nothing here to look at. Well, I guess we do have the sod house, [world's largest] ball of twine, meteorite and the worlds deepest hand-dug well." Their Texas trip will link to other trips they have made in the western U.S.